Last month as part of House of Pinhiero's #sewphotohop on Instagram I posted the picture above for the Tips and Techniques day. In the picture I'm applying fusible bias binding to the back neck of a cardigan sweater under construction. I had just made a short, 14-second video (an excerpt from a longer video I still haven't finished) with many of the key points for stabilizing the neckline and shoulders of a cardigan. Unfortunately, I couldn't get the short video to post Instagram, so I just posted a still from the videos instead. Video problems aside, this is the quickest and easiest way I've found to stabilize a cardi, and it works really well! Being unable to use video's quick cuts and fast motion in real life, I do admit that this technique will take longer than 14 seconds. 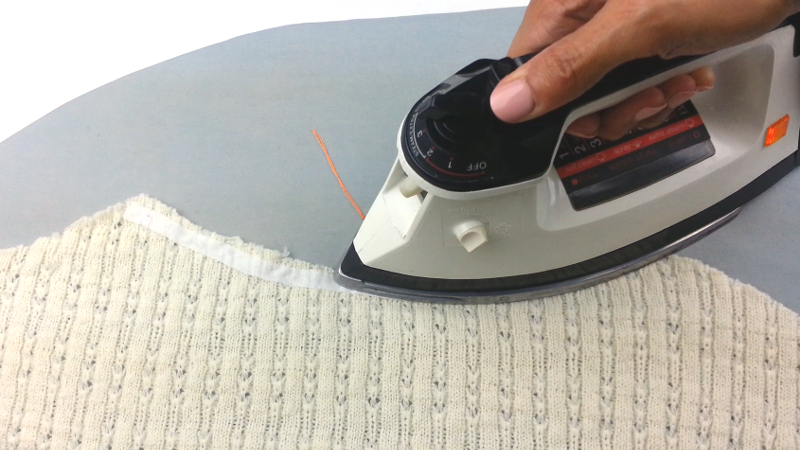 Still I consider it a "quick tip" and I use it for all cut and sew sweaters now. A pullover version of this technique was actually Tip #4 in my Five Tips for Using Commercial Sewing Patterns with Sweater Knits. The big difference with a cardigan is that there is more stress placed on the back neck of the sweater. This stress is what will stretch the cardigan neckline out of shape. The amount of stress depends on the style of the cardigan and the weight of the fabric. It's especially a problem when a rather bulky cardigan is worn open. If the cardi doesn't have a collar, the simple back neckline will have to support the weight of the front pieces as well as the sleeves. If your cardigan has buttons or a zipper, stabilization may be needed in those areas too. Here are some ways of approaching stabilization in those areas that I've written about previously: zipper, buttons, buttonholes. In the future I'll try to post other techniques I'm using. Now getting back to the neckline and shoulders, transparent elastic is often used as a stabilizer in ready-to-wear, cut and sew sweaters. As long as you're working with a natural fabric that can withstand the heat, using fusible tape as a stabilizer is highly recommended and really easy to use. Even scraps of fusible interfacing, cut into strips, will work nicely. Please note that this application is about the only time I'll actually press any area of a sweater knit. I usually steam with the iron held above the fabric. Pressing, however, is necessary to fuse the stabilizer to these areas. By pressing only the sewing line and seam allowance, the iron won't spoil the beauty of the natural fabric. And I don't iron. That is, I don't use a back and forth motion with the iron. It's press, hold, lift, and move to the next section. Remember to always test on a scrap first. This method is suggested for natural fabrics only! You'll have to sew in transparent elastic or another stabilizer if working with synthetics and many synthetic blends. If you've found this very short video helpful, but you need more details... no problem! I've prepared a step-by-step PDF guide. If you're on the O! Jolly! Crafting Fashion email list, you already have the link. If you're not on the list yet and you'd like the free PDF step-by-step Guide to Stabilizing Cut & Sew Cardigan Sweaters, get it here. Thank you so much for the tip I've been sewing for many years and never thought to uses this method what a time saver. You're welcome, Virginia. Glad to help!